Today I am happily thinking about two recent gifts. Last week my office friends (it always feels weird to refer to them as 'office' friends, since they are great friends that don't need a qualifier) gave me a special tea birthday present! An amazing variety of tea from Radiance. A package of loose white peony, a large can of aged pu'er, and a huge selection of bagged tea. I've already tried a few of the bagged teas, and the quality is very good. I will have to do a detailed review of the pu'er, as I am a pu'er novice and need to start learning more about it. I've only had a couple of sheng, and one shu. I look forward to trying all of the teas they generously gave to me. Thank you, office friends! 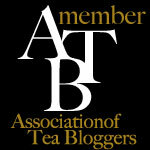 I am also very excited and honored to announce that I've just been accepted into the Association of Tea Bloggers! Thanks to everyone that reviewed my application. I am looking forward to expanding my knowledge through new information and discussions. New tea adventures await. The Assn of Tea Bloggers should be thrilled to have you! Fantastic news! Keep it up.